Montana- On April 22, 2011 Montana Senate Bill 135 allowing the use of dogs to track wounded game (and carrying firearms during such tracking), was signed by the Governor. The text of the relevant section reads: (a) A person with a valid hunting license issued pursuant to Title 87, chapter 2, may use a dog to track a wounded game animal during an appropriate open season. Any person using a dog in this manner: (i) shall maintain physical control of the dog at all times by means of a maximum 50-foot lead attached to the dog's collar or harness; (ii) during the general season, whether handling or accompanying the dog, shall wear hunter orange material pursuant to 87-3-302; (iii) may carry any weapon allowed by law; (iv) may dispose of the wounded game animal using any weapon allowed by the valid hunting license; and (v) shall immediately tag an animal that has been reduced to possession in accordance with 87-2-509. 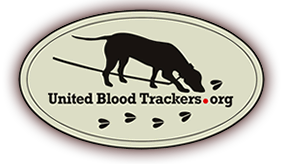 (b) Dog handlers tracking a wounded game animal with a dog are exempt from licensing requirements under Title 87, chapter 2, as long as they are accompanied by the licensed hunter who wounded the game animal."